According to Jordi Roura, the Technical Secretary of Youth Football, there are "four or five players at every level who have a bright future ahead of them"
FC Barcelona’s youth football teams are having a season for the ages. Their respective league seasons officially come to an end next weekend and, as of today, Barça’s teams have won 14 of 16 possible titles, tying the Club’s best ever mark, from the 2013/14 season. 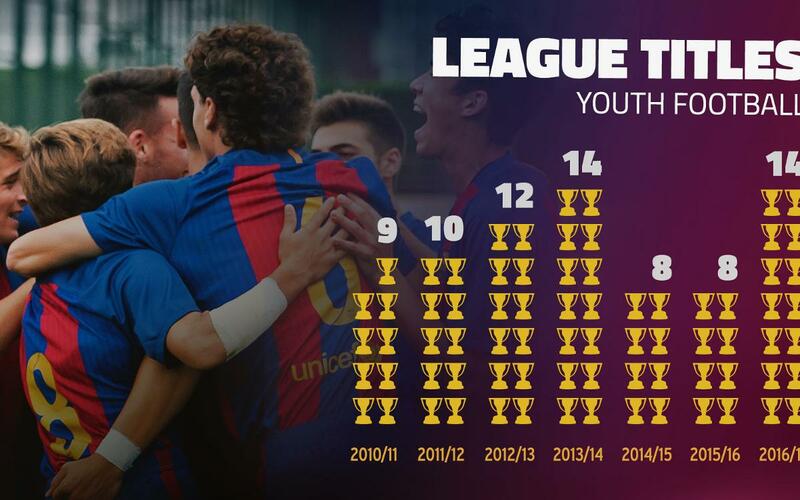 Thus, FC Barcelona has put up the same numbers as it had before the FIFA sanction, with an added plus — Barça is the club that has contributed the most players to the various Spanish youth national teams, an example of which came recently when six FCB players helped the Spanish Under-17 team win the European Championship in Croatia. "We are very satisfied with the season we are having," said Jordi Roura, the Technical Secretary of FC Barcelona’s amateur football teams. "Our results show that we are on the right path. The FIFA sanction made us stronger and now our football academy is doing some impressive things." Roura said that beyond the results, one must point out that the Club currently has "four or five very good players on each team who have long and bright futures, and who could one day make it all the way to the first team." "This is the key," he said. "That is what is really important." FC Barcelona has shown incredible resilience in the wake of the now infamous FIFA sanction, during which the clubs youth teams won just eight league titles in the 2014/15 and 2015/16 seasons, far less than the 14 championships won in the 2013/14 season, the 12 won in the 2012/13 season, and the 10 won in the 2011/12 season. It seems that, finally, everything has returned to normal.